“Green and Gray,” featuring 13 Arizona artists, takes as its mission to dispel the notion that green always connotes nature and living things, and that gray usually stands in for artificiality and decay. The dichotomy between the natural and the manmade is irresistible to artists. 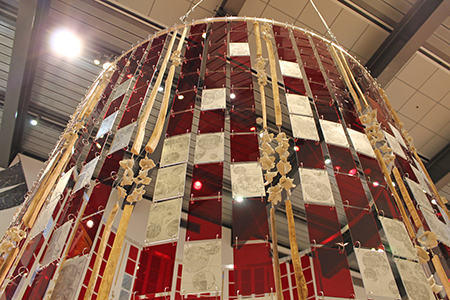 In one of the show’s best works, Christine Cassano presents a 9-foot-tall, walk-in installation titled “Permeable Facades & Internal Alterations.” It brings the viewer inside a round “curtain” of blood-red plexiglas segments and mirrored circuit boards that are dangling next to porcelain vertebrae. Joining the “bones” are saguaro ribs on which friends have carved messages about life-changing moments. It adds up to a sense of internal “green” biology vying with external “gray” technology. Susan Beiner turns to bulbous, botanically inspired ceramic forms — two of them set opposite each other and both called “In Versus” — to send a message that the “green” processes of plant life in a natural state are in jeopardy given the rise of lab-assisted horticulture, which she characterizes as sterile by making one of the ceramic forms almost identical to the other, yet grayish white. Candice Eisenfeld waxes philosophical on urbanization by giving the same painterly attention to utility lines as she does to idealized landscapes of clouds and trees. Other artists explore ideas such as decayed buildings and our place in the universe, making for a varied and often profound show.